Dairy Foods Partners: Let’s Do the Right Things in 2016. ‘Tis that time of year when predictions and lists are posted in abundance. I promise to keep these points brief and simple. I won’t even number them, as they all sort of meld together. They are common sense, with your conscience guiding you the right way. It’s hard to ignore Chipotle these days. The company has become fodder for all media outlets and a case study for advertising and marketing professors. For microbiologists and food scientists, Chipotle just makes us shake our heads and think this could have been prevented. The fact is that the company may never know the ingredient source of the E. coli outbreak that occurred about a month ago. This is because the infecting inventory was no longer in house when the quick-service chain that prides itself on fresh and natural ingredients was identified by the Center for Disease Control as the provider of the deadly pathogen. By that time, the food had either been served or tossed. One thing Chipotle does know is that it will be much more discriminating with its suppliers on food safety precautions, as all of its sourcing practices may sound appealing to today’s consumers, until someone gets sick, then “food with integrity”—the company’s tagline—is not all that attractive. There’s something for all in the food industry to learn from Chipotle. Technologies—ingredients, processes and packages--have been developed and incorporated into the evolving food chain for a reason. To be fair, for some, adaptation is purely selfish. It’s all about the bottom line. But for many, and I do believe that is most of the dairy industry, it has to do with ensuring safety and delivering on quality at an affordable price to provide balanced nutrition. Chipotle’s mantra of fresh, never frozen, minimally cooked and unprocessed, has come to haunt the company. A key lesson for all in the food industry is to refrain from negative marketing of traditional food practices. 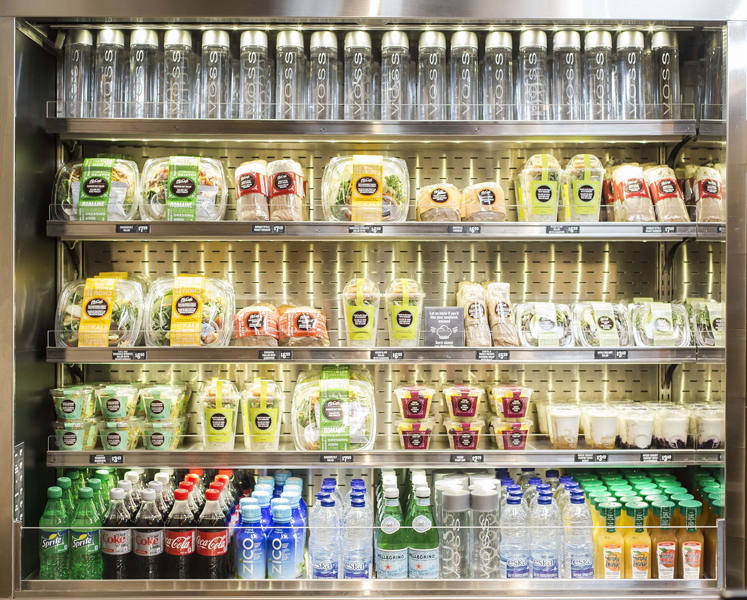 Chipotle says it now plans to slice and dice at off-site commissaries and deliver cleaned and trimmed produce to its stores. How’s this different than purchasing the same ingredients from an approved food manufacturer following good manufacturing procedures and a proper HACCP plan? This commissary approach comes with a hefty price tag. There’s rent, labor, packaging materials and transportation. It does not sound like a sustainable approach to sourcing ingredients. It sounds like a company that dug itself in a hole and is not sure how to get out. Your efforts are appreciated Chipotle, but there’s a reason why those preservatives are in the shells, and why so many others in the food industry rely on them. It’s to reduce food waste, a major issue in the U.S. and around the world. The Food and Agriculture Organization (FAO) of the United Nations estimates that about one third of the food produced globally for human consumption--approximately 1.3 billion tons every year--is lost or wasted. Accidental or intentional, this discard at both the retail and consumer levels has far-reaching social, economic and environmental ramifications. Seems to me that a little preservative makes those tortillas a more sustainable product. Natamycin in cheese, yogurt and sour cream, especially in products intended for foodservice or require lengthy shelf lives because of distribution chains, also makes sense, as do other food safety technologies. The dairy industry must unite and protect our powerful, effective food safety practices…from farm to fork. This includes medicines for maintaining the health of cows all the way to pasteurizing milk. But that does not mean we cannot do some things better. The Listeria outbreaks in ice cream and soft cheese this year hurt all of us. The problem with Listeria is that it is everywhere. About 10% of humans are carriers without even knowing it. It’s found in soil, water and the intestines of some animals. Most infected animals show no symptoms, so the bacterium can be transferred to raw foods such as unpasteurized dairy products, raw vegetables and raw meats. Further, unlike other types of foodborne pathogens, Listeria grows at refrigerated temperatures. When it invades a manufacturing facility, it can survive and thrive for many years. Extra testing and proper sanitation are paramount, so is proper pasteurization. Heat kills Listeria. Pasteurization is not an unnecessary technology. It’s a proven food safety technique. In closing, I would like to say reach for the low-hanging fruitful opportunities in 2016 to make your products more appealing to today’s consumers. Maybe it’s time to revisit product formulations and simplify them. I cannot tell you the times that product developers have said that the only reason an ingredient was added to a formulation was to fix a problem, rather than eliminate the problem. Some ingredients—often ones with not so nice names--function only as a bandage. This includes the full spectrum: from stabilizing ingredients to sweeteners to colors. Let’s not give anyone a reason to critique our products or practices. 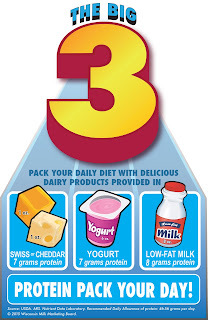 Dairy foods have a healthful halo. Let’s—together—make that halo stronger in the New Year. The Daily Dose of Dairy Friday blogs will resume on January 8th. The daily new products will continue to be sent Monday through Thursday during the holiday season. 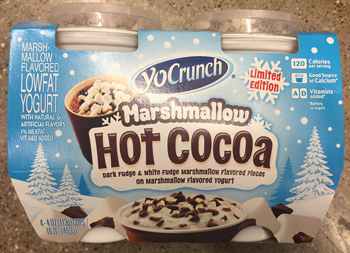 Many will have a holiday theme, such as the YoCrunch Marshmallow Hot Cocoa yogurt that opened this blog. We must never lose sight of the fact that dairy foods should be safe, delicious, nutritious, affordable, and yes, at times, fun. After all, there’s always raw almonds and kale leaves. In case you find it as hard to believe as I do, here’s a quick reminder, it’s almost 2016! All I can say is thank God for Amazon Prime, or else my sons would not have much under the tree this Christmas. There’s no time to shop. Though I’m not working from dawn to dusk milking cows or converting their great gift to delicious dairy foods, it is time consuming staying on top of innovation, science and policy. 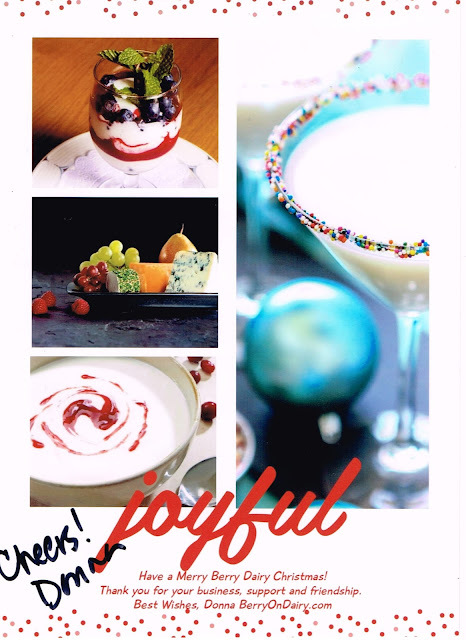 I sincerely appreciate the positive feedback from the 7,000-plus global subscribers to the Daily Dose of Dairy. You make it all worth it. Quick favor: if you have not already, please complete a very brief survey by linking HERE. Positive feedback motivates industry suppliers to support Daily Dose of Dairy/BerryOnDairy.com and without that support, this innovation tool could not stay alive. For every survey completed, I will be donating $1.00 to the Great American Milk Drive. (If you all respond, that’s a lot of milk money.) Learn more about this powerful program that donates gallons of milk to families in need through local foodbanks by linking HERE. Thanks in advance. Let’s kick off today’s blog with an innovation idea, a challenge, per se, for your 2016 product development team. This week I wrote an article for commissary insider, a monthly supplement to instore magazine, on boosting protein in ready-to-eat, grab-and-go foods. The reader is the culinary professional who designs the sandwiches, salads, sides and entrees sold at kiosks, coffee shops and retail foodservice merchandisers. This is a booming segment. 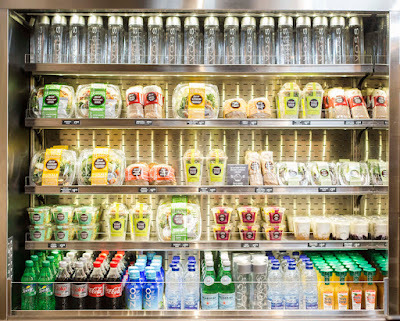 With retailers such as CVS, Walgreens and 7-Eleven expanding refrigerator space dedicated to such freshly hand-packed convenience foods. Here’s the innovation challenge. 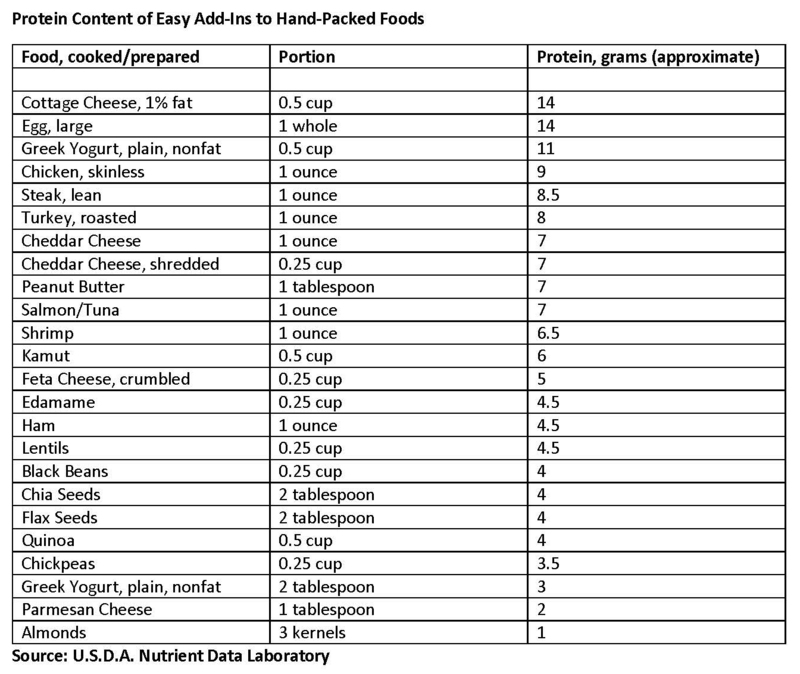 A growing array of commissary-prepared meals and sides have started touting nutrient contents, most notably protein. Let’s make sure they are choosing dairy proteins. 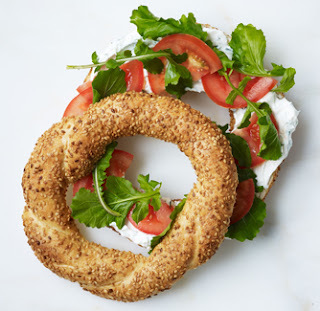 The basic dairy foods staples are great add-ins, but what if you were to formulate a Greek yogurt-style dressing or spread as a high-protein alternative to mayo or cream cheese. According to the Natural Marketing Institute, the demand for protein has increased significantly during the past eight years. The research firm has data that indicates more than half (53%) of consumers sought out foods high in protein in 2014, up from 39% in 2006. Let’s make sure dairy protein is a readily available option. I recently visited My Fit Foods, a Houston-headquartered business that provides fresh, healthful, on-the-go foods in a retail shop environment for take-home consumption. The company emphasizes lean proteins, low-glycemic carbohydrates and heart-healthy fats in all of its meals and snacks. According to the company, a daily average of 40% protein, 40% carbohydrate and 20% fat is the optimal macronutrient percentages for balancing blood sugar and optimal energy production and fat burning. The culinary professionals at My Fit Foods make smart ingredient choices to boost protein contents. For example, a small serving (two) of breakfast tacos contains 370 calories and a whopping 29 grams of protein. This is achieved through the use of lean ground turkey with eggs and cheddar cheese. For lunch or dinner there are enchiladas filled with chicken and spinach held together by nonfat Greek yogurt. They get topped with tomatillo salsa and cheese and come with a side of beans. A small serving contains 360 calories and 25 grams of protein. A small serving of Fit Nugget Nation, which is described as house-made almond-crusted chicken nuggets with a side of cauliflower mash and green beans, provides 29 grams of protein and 410 calories. One of the little tricks to increase protein is to prepare the mash by blending cottage cheese with the cauliflower. 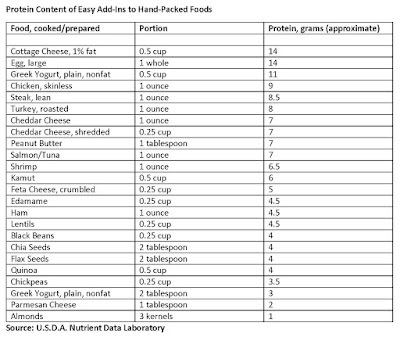 The protein trend is expected to grow, as is the demand for hand-packed foods. Make sure product designers are packing in dairy proteins. 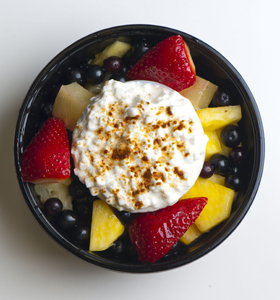 According to Tammy Anderson-Wise, CEO of the Dairy Council of California, dairy processors are sitting atop one of the hottest trends in nutrition with a product line that naturally delivers what consumers seek more of in the name of good nutrition: foods high in protein. The Dairy Council of California recently published its fall Trends newsletter, which contains food and nutrition issues likely to impact the dairy industry in the next one to three years. Dietary Guidelines. The 2015 Dietary Guidelines for Americans, slated to be released before the end of the year, but it’s looking like it could get pushed into early 2016, are more contentious than in the past. The good news is that milk and dairy foods fare well in the Dietary Guidelines as they are included in all three recommended dietary patterns. Local Foods Movement. Locally produced natural foods top consumers’ desirable list. Consumers are increasingly vocal about wanting to know where their food comes from. Nutrition and health are not always top of mind as other factors are being considered such as where and how food is produced, how fresh it is and whether sustainable methods of processing and packaging are used. Consumers are skeptical of big food industry practices with regard to animal welfare, genetically modified organisms and use of pesticides and antibiotics. There is a small but growing movement back to whole foods as a way to eat more natural and fewer processed foods. For dairy, this means a growing acceptance of whole milk, butter and full-fat yogurt as dairy fats are perceived more favorably. Read more about “Putting transparency first” in an article I recently wrote for Food Business News by linking HERE. Nutrition Makes Sense. The link between nutrition and mental and cognitive health is gaining steam. Many experts consider foods to assist mental and cognitive health as the next “big thing” in nutrition. The good news is that science shows that dairy plays a role as part of a healthy diet throughout life. Consumption of milk and milk products has been linked to improved cognitive function in children and older people in preliminary studies; however, more research is needed to confirm this connection. Cheese Unlimited. Cheese—once shunned for its high content of saturated fat and sodium—is cautiously coming back into favor for its high protein and calcium levels and low sugar and lactose levels. With only a few ingredients, many cheeses are seen as natural and fresh. Research showing that saturated fat is not associated with heart disease as once believed, and that sodium may not be harmful in many people, is also slowly taking the stigma off cheese. You can read the complete Dairy Council of California Trends newsletter by linking HERE. A survey of 1,000 adults conducted in mid-November examined how attitudes about animal fats in the American diet have changed in recent years, and how consumption patterns may be changing as well. Respondents were asked whether they were more or less open to animal fats, and whether those views extended to actual behavior. The clear finding: where animal fats are concerned, youth will be served. This is an excellent opportunity to get creative in snacking cheeses geared towards the palates of the millennial generation. According to the survey, those in the 18 to 34 age bracket are twice as open to animal fats as the next oldest group (35 to 54)—15% vs. 7%--and three times as open as those 55 and over (5%). Behavior does indeed follow attitudes. 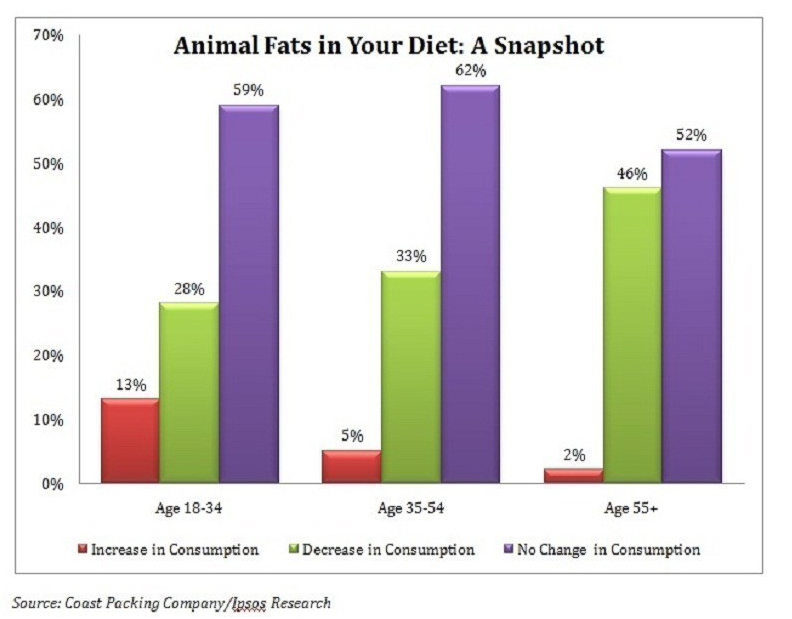 By a wide margin, those 18 to 34 are leading the charge back to animal fats. Thirteen percent say their consumption has increased. In fact, consumption is dramatically higher than those 35 to 54 (5%) and those 55-plus years (2%). Just 28% of those 18 to 34 say they have reduced their intake of animal fats, vs. 33% of those 35 to 54 and 46% of those 55-plus years. Age is the most decisive differentiator among the various demographic filters, the survey found. Flipping the age bracket around, a greater percentage of those 55 and up were less open to animal fats (35%) than any other age group, by a roughly 10% margin. Those 35 to 54 were most set in their ways, with 67% indicating that there had been no change in their attitudes in recent years. By gender, men are more open to animal fats than women (11%, compared to 7% for women); similarly, a smaller percentage of men reported being less open to animal fats (27%, to 31% for women). Think manly cheese snacks, big sticks in bold flavors. To request a complete copy of the survey results, link HERE. This research supports findings published in another hot-off-the-presses report, the annual trends publication--What’s in Store--from the International Dairy-Deli-Bakery Association (IDDBA). 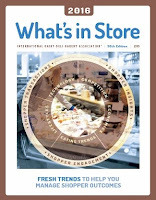 In its 30th year of credible reporting, What’s in Store 2016 is an essential dairy-deli-supermarket foodservice-bakery-cheese resource providing vital data on the retail and market trends, growth and category changes shaping the food industry. 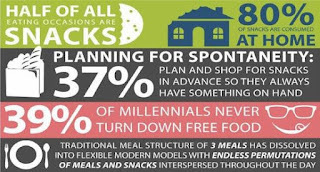 According to IDDBA findings, 53% of shoppers are now opting for smaller snacks; 47% say they really enjoy anything new and different or trying new kinds of ethnic cuisine; and 61% are now opting for healthier snacks. “Local” is a quality distinction marker and signifies for consumers: greater transparency and trust; fresher and more seasonal products: good taste; and support of the proximate food economy. When it comes to cheese, the report shows that per-capita cheese consumption in the U.S. is at an all-time high, with nearly 34 pounds per person. 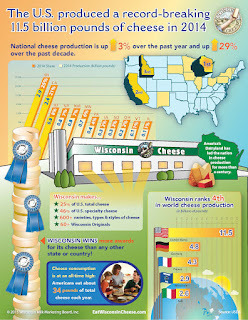 U.S. per-capita cheese spending has increased by 37% since 2008. 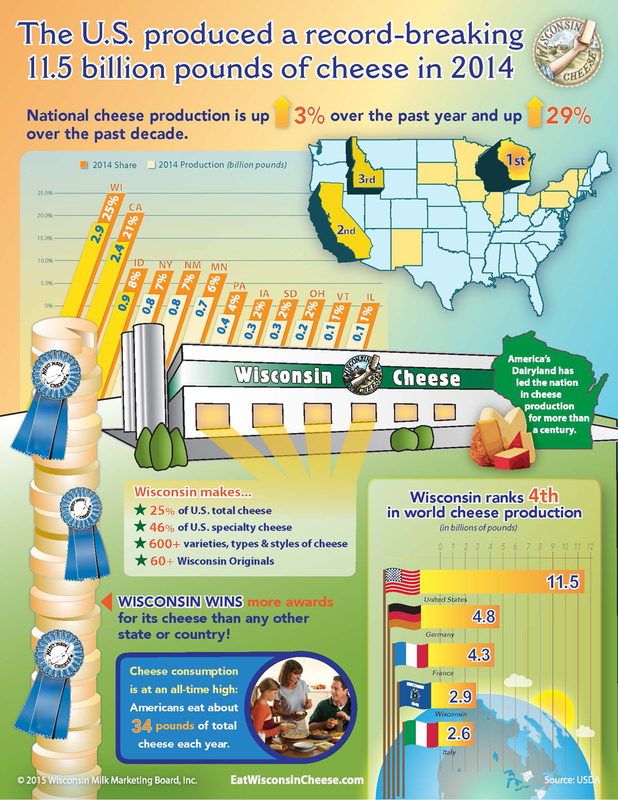 Ninety-eight percent of American households purchase cheese; 97% buy natural cheese and 70% buy process cheese. Millennials are an important cheese consumer, given their desire to try new flavors and textures, as well as belief that specialty/craft and imported cheeses are worth paying more for. This includes in snacking and “tasting” formats. Protein is a top consideration for consumers when purchasing dairy products, as 78% believe it contributes to a healthy diet and 16% look at the amount of protein when shopping. According to Nielsen data cited in What’s in Store 2016, snacking cheese dollar sales in 2014 through all U.S. retail outlets increased 7.7%, reaching almost $1.5 billion. Unit sales were up 3.1%, indicating consumers are paying more for snacking cheeses, which suggests snacking cheeses have gone premium and command a higher price tag. For more information on the report, link HERE. 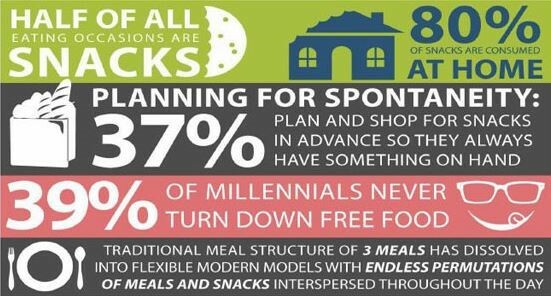 Developed in conjunction with The Hartman Group, the report identifies key ways food retailers can elevate snacking experiences across bakery, dairy, deli, prepared foods and specialty cheese to meet consumers’ evolving needs for customizable, convenient and healthier snacking options, as well as new taste discoveries. Here are some recent millennial-centric snacking cheese innovations from America’s Dairyland: Wisconsin. 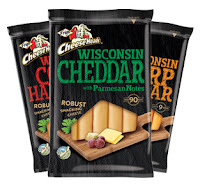 Saputo Cheese USA now offers a Wisconsin Snacking Cheese line with the tagline of “robust snacking cheese.” There are seven millennial-friendly varieties: Cheddar with Parmesan Notes, Chipotle Cheddar, Colby Habanero, Colby Jack, Pepper Jack, Sharp Cheddar and Smoke Flavor White Cheddar. 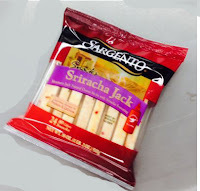 And here’s one that screams millennial palate: Sargento Sriracha Jack cheese sticks.